More big media companies want to determine consumer usage and reach of new digital media platforms. 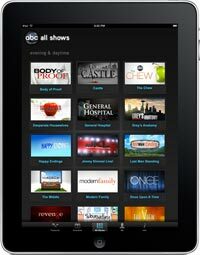 Now Disney/ABC Television Group has announced an effort with Nielsen to measure video consumption on iPads. With 55 million different versions of iPads now sold -- and another 3 million new iPads sold in the last few weeks -- the companies say it's important to understand how consumers are using the iPad when watching video. Nielsen will create a panel by asking 200 people to download a special "meter," which will measure reach, duration, frequency and page views of their iPad apps and Web usage. The opt-in Nielsen iPad panel will aggregate and measure video consumption, app usage and other activity over the course of a year. The companies believe the study will offer the first view of actual iPad behavior -- as opposed to self-reported data -- along with demographics and other insights. Disney has been studying consumer tablet behavior for some time, but now wants some deeper data. “Nielsen’s proprietary technology has the potential to deliver unprecedented additional details about consumer viewing patterns,” stated Peter Seymour, executive vice president of strategy and research for Disney Media Networks. Disney isn't the only media company looking to find deeper analysis. Recently, media agency Group M announced a deal with Nielsen to measure cross-platform -- traditional TV and other digital media -- reach and frequency of Group M clients media campaigns. 1 comment about "ABC, Nielsen Team To Measure iPad Video Consumption". Daryl McNutt from TapClicks, March 29, 2012 at 11:14 a.m. It's great to hear folks doing research but the industry needs to start asking these research companies to crack open the "proprietary technology" for true peer review if we are to determine if the correct methodology is being used. Research companies in this industry are businesses and not unbiased academic observers. We definitely need them but many times they are not caught up on the new technologies or are using out dated methods for research. I like the effort but Nielsen continues to struggle with measurement of the internet. If it works then show us don't just tell us.